Determining your ERP system requirements involves more than determining which features and tools your business needs. In order to really revolutionize your operations, you need to think about your goals and how your vendor will meet them. What Will My Business Look Like in the Future? Like Featherson says, it’s beneficial to take a little extra time putting together your ERP system requirements checklist. When shopping for an ERP solution, you need to think about how you currently do business but also how you will likely do business in the future. ERP software is a major investment and with any luck, the next system you choose will be the one you work with for many years. Make sure your next system can handle added users when your business grows and you hire more staff. Moreover, check to see if your vendor offers modules you don’t need now, but might later on. What Will My Vendor Look Like in the Future? In addition to your own future, think about your vendor’s next moves. Do a little research into their past products and strategy. Check to see if they continue to invest in their products or if they are quick to sell. In addition to the long-term, think about your vendor’s role during implementation. It might even be helpful to create an ERP implementation checklist. Include what kind of support your team will need and the budget available. If they don’t offer the help you need at a price you can manage, it’s best to keep looking. Who Will Use the System Most Often? While an ERP system is a large investment, a successful implementation ensures more efficient processes, centralized data, and reduced errors and costs. But none of this can happen if your workforce doesn’t adopt the system. The best way to encourage high adoption rates is to get your employee’s input before you buy. Understand their workflows and how a new system could help or hinder them. This information is also handy as you create your ERP documentation. Which Requirements Are Most Important to My Business? In a perfect world, you’d be able to find an ERP vendor that can cater to all your requirements for just the right price. But in the real world, you’re more likely to make some sacrifices. Deciding early on which ERP software requirements are more important will help you keep an objective mind as you shortlist ERP products. One of ERP’s greatest strengths is its ability to automate, streamline and analyze the vast majority of accounting operations. Without a software system in place, your team can spend dozens of hours each month on tedious tasks like payroll, invoicing and budgeting. But when these processes are automated, you enable your staff to shift to a more advisory role. ERP software aids in this adjustment further by providing analytical tools. ERP’s quick yet accurate analysis reduces errors and allows organizations to properly gauge their financial health across all departments. Many businesses invest in ERP due to its exceptional ability to manage and analyze human capital resources. Automated Human Capital Management is a valuable solution that manages hiring data and monitors individual productivity. By automating tasks like benefits administration and tax calculations, ERP drastically reduces the potential for human error. This results in increased efficiency and fewer financial losses due to inaccuracy. ERP’s ability to manage manufacturing processes saves time and money by maximizing staff hours. It ensures accuracy, gauges organizational productivity, identifies weaknesses and automates much of the supply chain. 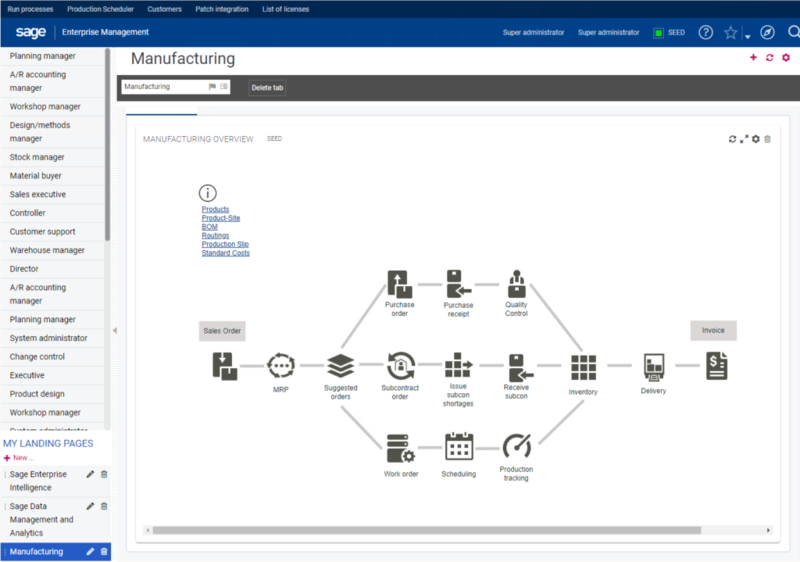 Manufacturing and distribution process management is especially beneficial because it completes tasks such as production control, quality analysis and distribution scheduling that often consume many hours of staff time. Many ERP systems allow a quick overview of your processes, as well as more specific information with drill-down capabilities. Materials Management allows businesses to monitor stock, deliveries and orders. ERP also uses historical sales data to predict sales trends, which allows businesses to determine optimum stock levels. These functions give retailers and manufacturers the ability to meet revenue goals, maximize storage space and eliminate unprofitable inventory. Sales and order management tracks and analyzes sales data, automates transactions, monitors performance, tracks expenses, and even manages order preparation and customer credit. ERP uses historical data to determine ideal price points and prime inventory numbers, saving businesses a great deal of time by removing the need to manually perform price/profit calculation. It also allows you to immediately locate any item in your warehouse, which streamlines order processing. All of these functions ultimately save businesses time and effort while increasing accuracy and efficiency throughout the organization. Supply chain management (SCM) tools facilitate the operations involved in getting a product from a supplier to a consumer. SCM suites manage functions related to procurement, distribution and resource management. Consequently, those who tend to find SCM suites particularly valuable are often retailers, manufacturers and distributors. A major benefit of SCM software is its ability to automate the tedious tasks necessary to the supply chain. This feature enables businesses to spend less time on repetitive work, which results in higher productivity levels and increased speed of operations. Additionally, automation reduces the risk of human error by decreasing the amount of user intervention needed to complete an order. This increases accuracy and eliminates error-induced costs. ERP offers many valuable capabilities in regard to customer service management. First, many systems offer automated marketing tools that allow users to plan and carry out campaigns through their entire lifecycles. These include robust analytical tools that help businesses improve the customer experience from start to end and increase retention rates. Sales tools enable users to manage sales orders across all channels. ERP systems allow users to quickly look up customers to access contact information, past invoices and more. This includes supporting procurement activities as well as distribution practices. Customer service management also incorporates features to manage customer accounts. Centralizing all your customer data in one place can be very helpful, especially for businesses that want to get an in-depth understanding of their clients. ERP integrates seamlessly into your existing infrastructure. This allows for full implementation with minimal disruption to business operations. Once implemented, ERP offers a single, intuitive portal through which businesses can perform tasks, analyze data, generate reports and integrate new applications easily. Ultimately, ERP’s integration ensures staff will be able to use the system quickly and effectively. Even though many ERP vendors offer both on-premise and cloud deployment, you should still give this aspect some thought. On-premise systems offer a greater level of control and customization over your ERP. However, it comes at a steep price. On-premise solutions typically are more expensive to set up, take longer to implement and are difficult to update. But for businesses with strict security compliance requirements or little access to the internet, they can be a good alternative to cloud computing. Cloud-based systems are quick and easy to implement, don’t require a ton of maintenance staff and are cheaper upfront. But these solutions don’t offer as much customization and can raise many questions over data ownership. However, each business is different. What works for one company might not work for yours. Ensure your ERP vendor offers the kind of support that allows you to get the most out of the system. While ERP is an intuitive solution with a surprisingly minimal learning curve, it is a complex system that may require troubleshooting, training or even repair. Thus, it is extremely important that your ERP provider offers excellent user support. Ultimately, procuring the right ERP solution comes down to knowing what your business needs. If after reviewing our ERP checklist you still need help determining your organization’s ERP requirements, use SelectHub’s free ERP requirements template and selection tool. What did you think of our ERP requirements list? Did we hit all the requirements you’ll be considering? Let us know by leaving a message down below! Awesome and unique research about the ERP checklist in the different industry. Most of the customers are not aware of the ERP checklist and they will search for efficient ERP software for their business. First, we want to know how ERP will help our business and what are all the checklist the software should have. This post will help the B2B and B2C companies to know about the ERP checklist. Is the checklist from the article not loading or is the template you requested not loading? Please let us know so we can help you get the information you need! The best way to increase your ROI is by implementing a proper ERP system. There are so many things you could do better as a company…you cannot imagine. Good checklist, well done. Thanks for reading. We are sorry you are having difficulty accessing the checklist. Please try checking if the email that you used when filling out the form is the correct address. If the issue persists, please feel free to give us a call at 877-692-2896 and we can investigate further.